Here's a board that says it better than flowers and will last a lifetime! Perfect for Valentine's Day, engagement gifts and weddings. It's available in two versions - a cutout design and also as a recessed design. 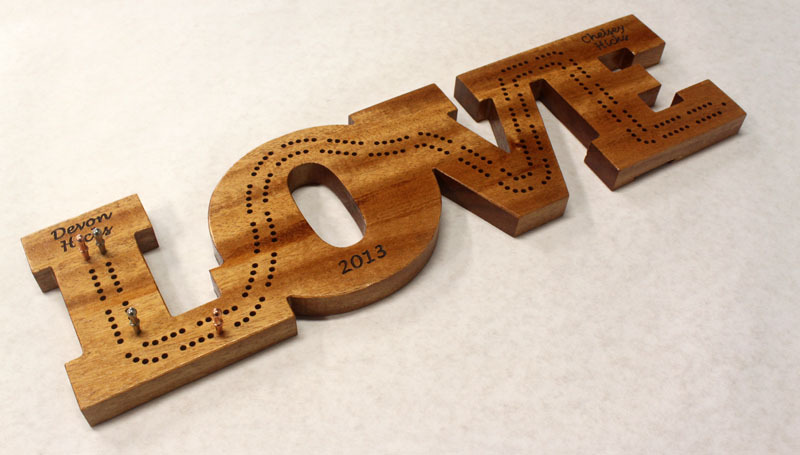 The cutout version is the one with a hole in the "O" and is made of the letters LOVE joined together. It measures 5" tall and 20" wide. The recessed version is the one with the rectangle backing and the letters LOVE are raised from the surface. It measures 6" tall and 21" inches wide. The price includes two names and a date engraved on the front for both versions. After sanding smooth, this board is brushed with shellac to protect the wood. Boards made with cutout lettering may become damaged by mishandling such as dropping and bending - there are certain weak points we cannot avoid. Cutout boards need extra packaging for protection in the mail and $7 is added for this. The recessed version was developed to reduce this likelihood.